Aaron Hill, a 15-year-old from Big Stone Gap, Virginia, was this year’s winner of the One Shot with a bird that scored a 79 on the NWTF scale. His bird weighed in at slightly over twenty-one pounds, with a foot-long beard and nearly 1 ¾ inch spurs. On the bird of a lifetime, Hill never pulled the trigger. He pulled his bow back. Here is his story and the One Shot. Hill harvested his first-ever turkey, and the highest scoring turkey of this year’s One Shot event with his compound bow. He was guided by DGIF biologist and Big Woods Wildlife Management Area Supervisor, Matt Kline, who set the ground-blind up and scouted the area before guiding Aaron and his father, Greg. “Matt asked me if I could see the turkey coming, and I peeked out and said no, then I finally saw him and I about had a heart attack; it was so beautiful. Full strut and everything,” said Hill. This was Hill’s first experience turkey hunting. He wanted to face the challenge of hunting a turkey with his bow. “I thought my arrow had hit low and I was anxious to make sure I had done my part right and hit him in the right spot,” said Hill. “I did, and the turkey didn’t suffer more than he had to, which is what I cared about,” he said. Hill’s bird was taken within an hour of sunrise, making it the second turkey harvested of the day. He recalls hearing turkeys gobbling all around him as the woods were waking up. Though it was a quick, action-packed hunt, Matt Kline said sharing the experience with Hill and his dad was unforgettable. “I don’t want to put everything on success; that’s just icing on the cake. Just to be able to share that hunt with them was a special time in the woods,” said Kline. “Seeing how excited he was really made the hunt all the worthwhile,” he said. For Kline, being a part of the next generation of hunting by guiding is his favorite component of participating in One Shot. He grew up involved in YHEC, the Youth Hunter Education Challenge Program of DGIF, and says that it’s rewarding to be able to give back to what inspired his hunting passion growing up. “Aaron and his dad kept thanking me, but I was thanking him and his dad for letting me be a part of that moment,” said Kline. Aaron Hill learned to shoot archery through the Scott County Outdoor Team (SCOT) when he joined at age 11. SCOT was funded by the Virginia Wildlife Grant program for three years. Hill’s experience has been brought full circle since it began four years ago. He shoots archery competitively locally and at national ASA tournaments. He’s even trained and tested to be a USA Archery Level 1 Coach. Hill Started GOD’S Archers at 14-years-old, a ministry program that uses archery to teach people about God. He and his dad travel to church events and festivities to teach others about their faith through the components of shooting archery. At 15, he is already an inspiration to both young and seasoned hunters. In addition to supporting the Virginia Wildlife Grant Program to connect youth like Aaron Hill to the outdoors, the One Shot event generates revenue to support access to land in Virginia by the Wildlife Foundation of Virginia. Recent purchases include Clay Hill, a 1,600 acre tract in Amelia County, and Guinea Marsh, an 800 acre piece of property in Gloucester. This partnership between DGIF and WFV supports the hunting heritage in the Commonwealth through One Shot but also other programs where the missions are aligned. The Clay Hill property was hunted during One Shot this year and two turkeys were harvested there, including the longest bearded turkey that was taken by Cephas Kaburu, a 2nd Lt. in the U.S. Army Reserve in Florida who is originally from Kenya. This was his first hunt and first time seeing a turkey. Perhaps a hunter for life now! 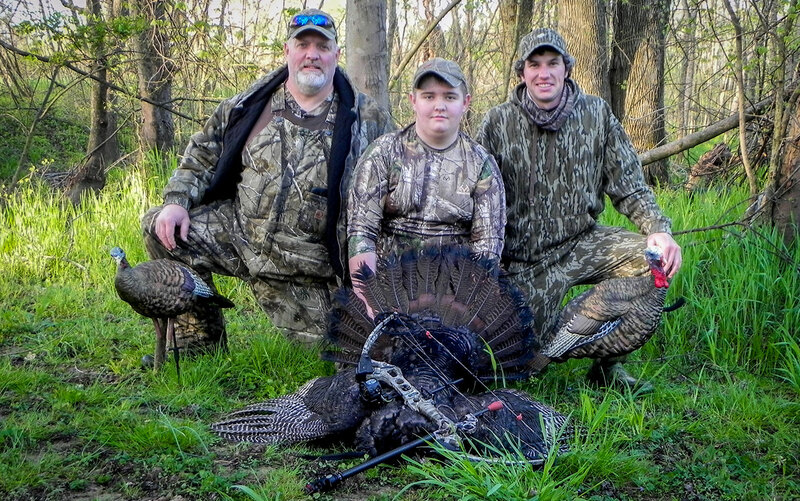 The 2018 One Shot Turkey Hunt provided 42 new experiences including a young man from the City of Richmond who knew only the urban environment, a son of a father on military deployment, wounded veterans, and others. Encouraging these enthusiasts is a motive for One Shot to help the heritage thrive. The planners of One Shot ultimately make the event successful with their passion of the outdoors. This year, 35 sponsors stepped-up to support One Shot which allowed the event to be more inclusionary and build new audiences. “Great people, doing great things, for great people!” said Bryon Conner, assistant general manager at Bass Pro Shops in Ashland, Virginia. The expectations are high for next year’s One Shot. 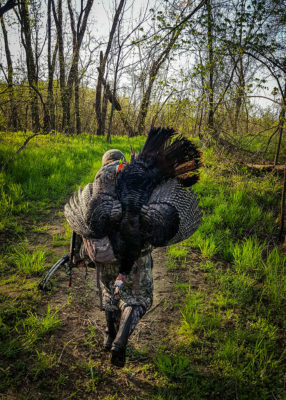 Regardless of setting a new record harvest or not next year, the success will be counted by the heartening atmosphere that the experiences will bring from sharing a memorable morning in the field, creating other stories like the tale of Aaron Hill and his first spring turkey.